Does geometry hold the key to revealing the mysteries of the universe? Throughout history humans have sought to discover some purpose to life, looking for order and patterns in the seeming random nature of our surroundings. In their quest for knowledge, our ancestors learned to unravel the importance of simple geometric shapes. Delving into these geometrical mysteries, mathematician and artist Karen L. French reveals the purpose of these shapes and shows you how they mold reality and your perception of it. French teaches you how they have a direct bearing on what you are and why you are here. She also shows how this knowledge can be achieved through the expansion of your conscious awareness, and how this expansion is made possible. Chapters include: The Language of Shapes; The Matrix of Space-Time-Being; Circular Grid of Time; The Single Central Point; The Interplay of Duality; Squared Grid of Space; Triangular Grid of Being; Creation in Motion; Getting Multi-dimensional; Window to our Mind; The Force of Life; The Direction of the Cross; Loving Hearts; The Great Work; more. A fascinating and visual all-color book! Published at $19.95, our price only $16.95! Imported from Britain. 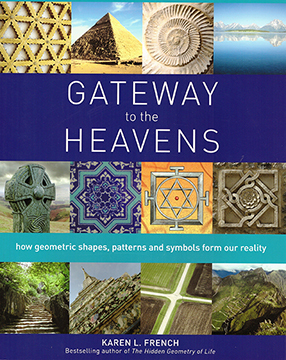 GATEWAY TO THE HEAVENS: How Geometric Shapes, Patterns and Symbols form our Reality By Karen L. French. 224 Pages. 7x10 Paperback. Illustrated. All Color. References. Index.